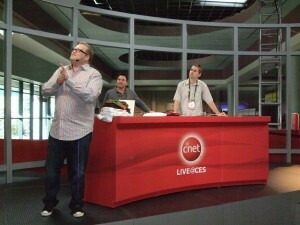 Drew Carey hosted a short tech trivia contest for CNET this afternoon here at CES. Carey’s joke during the contest summed up one of the major stories here here at the conference. Carey joked that the $50 gift certificates from CNET were going to be $100, but CNET “had tough year”. I spoke with CEA briefly and they said the preliminary counts indicate about the same attendance as last year’s which I think they said was 107,000 after the auditing that is mandatory for major shows. Of course I think that many attendees are from exhibitor groups so it’s not a simple task to determine the year to year trends in terms of the industry at large. 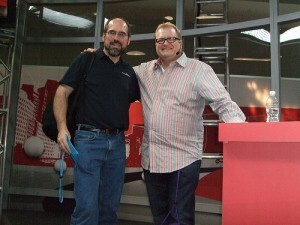 I think the Drew Carey analysis probably sums it up – 2009 was tough year in tech. However overall the feel here seems to be optimistic, and I think we’re seeing more from China as “good quality, lower price” may start to define the industry more than it has in the past.